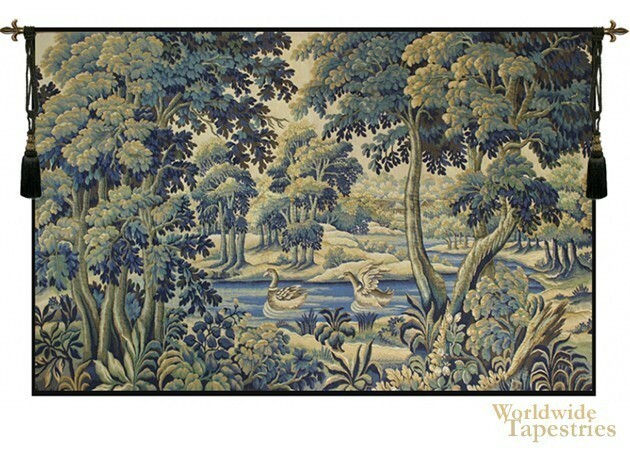 Verdure Colverts - without Border tapestry shows a French verdure scene of lakes, forests and swans swimming. Here in this work, the French verdure or greenery landscape shows the attention to detail in the rendition of the foliage and trees to produce its characteristic look of the verdure. The gradations and variety of tones make up the foliage and landscape to produce a beautiful work that celebrates the beauty of nature. These tapestries in this style were used in the 17th and 18th century to bring the colors and beauty of nature to the indoors. This tapestry Verdure Colverts - without Border is backed with a lining and a tunnel for easy hanging. Note: tapestry rods and tassels, where pictured, are not included in the price. Dimensions: W 78" x H 50"